Protecting newborns from dangerous whooping cough (also known as pertussis) starts with mom before the baby is born. Texas physicians say pregnant moms and moms-to-be need to get their recommended pertussis vaccination to protect themselves and their babies. 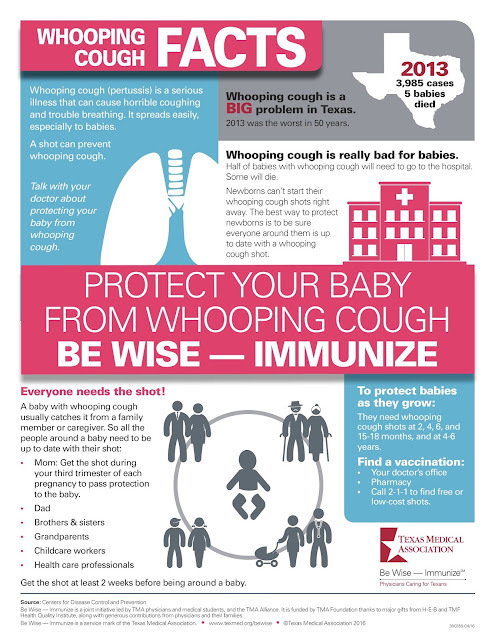 Whooping cough is especially dangerous for infants younger than 1 year of age. It is highly contagious, and the Texas Department of State Health Services says more than half of babies less than a year old with pertussis must be hospitalized. Many will have serious complications, like pneumonia or apnea (slowed or stopped breathing), and some become so sick they will die. Check out the infographic below created by the Texas Medical Association to learn why getting the whooping cough vaccination is so important and how the disease ― and the vaccine that prevents it ― works.